For background information, see the chapter Summary of Model Options in Defining DeepSee Models. DeepSee provides an option for renaming the Count measure so that you can prevent this from occurring when it is not appropriate. When that cube is built, DeepSee determines the initial members of all levels of that dimension, in the usual way. When the source class receives additional data and the cube is updated, DeepSee adds additional members for any levels, in the usual way. By default, the shared dimension uses the same source properties or source expressions that are used in the Dependent Cube. To override these, edit the class in Studio, find the applicable <dimension> element, and add child <hierarchy> and <level> elements as needed; see Reference Information for Cube Classes in Defining DeepSee Models. In this case, the dimension name, hierarchy names, and level names must be the same as in the other cube. The cube that owns the dimension must be built first. This process creates the tables for the dimensions defined in that cube. When you build the other cube, as DeepSee processes records, it adds records to the dimension tables of any shared dimensions. The Patients cube (in the class DeepSee.Model.PatientsCube) includes the HomeD dimension. This dimension includes an H1 hierarchy, which includes the ZIP and City levels. Similarly, the Cities cube (in the class DeepSee.Model.CityCube) contains a dimension named HomeD, which includes an H1 hierarchy, which includes the ZIP and City levels. The display name for HomeD is CityD, so that the dimension appears to have a different name in this cube. As before, the source properties used by the levels are different in the Cities cube than in the Patients cube. 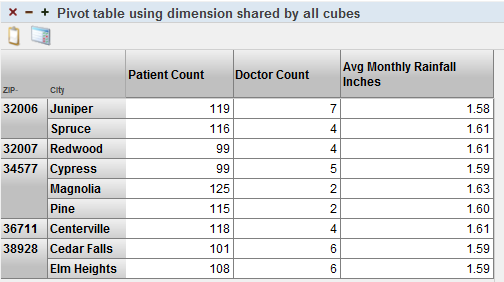 The cube CompoundCube/Patients, which is defined in DeepSee.Model.CompoundCube.Patients defines all the dimensions.